Thanks to Mira Ink/Harlequin TEEN for the ARC of this book! As always, my reviews are fair and non-bias. This is easily one of my most anticipated reads of the year and I've been looking forward to reading it for so long. I'm so impatient when it comes to waiting for books to hit shelves, haha, so I was thrilled to get the chance to read it! It's fair to say that Let's Get Lost is my new favourite "road trip" book. I've been practically glued to it for days, never wanting to miss a single thing. All the characters, towns and memories that Leila left them with had just beautifully and effortlessly become a sensational YA one of a kind. Bree is a runaway, although she's not alone in her travels when Leila meets her on the side of the road. They have a ton of fun and Bree's life is quite inspired despite her reasons for running away and her emotional past. She's a little rebelious but in a free spiritied kind of way and her story was by far my favourite. Her and Leila seemed like they also struck a friendship that's again, a rare thing to find. Leila helps her, maybe even getting in a little trouble on the way, but when we leave Bree, it's a story of a girl you'll never forget. Elliot is such a hopeless romantic and the love of his life and best friend's course of love has just gone off track in a way he couldn't have anticipated. He meets Leila (or maybe she kind of just drives right into his life) and she is inspired to make him get his happy ever after. Leila helps him believe in love even when he wants to give up and I quite loved his story, too. They were ALL so amazing - and it's rare to find a book where there are so many things you love wrapped up in one - so it's no wonder the last story of Sonia leaves me with the most impression. She lost her boyfriend tragically and moving on his hard for her, especially when you throw a wedding into the mix. Leila witnesses how loss can change a person, and even opens up Sonia's eyes to grasping what you have and not letting the fear of love get in the way of having a second chance. Leila is one of the best characters in YA literature. She has a unique and painful past that sparks her interest in her journey to the Northern Lights (a place I really want to see, even before the book, but more now!). Her past is a place she can't quite see, but holds onto the memory of finding love with Hudson and the bittersweet memory of the Northern Lights in a poignant, stunning novel that I'm positive is going straight to the top of everyone's must-read list. Let's Get Lost is an absorbing, beautiful novel we all need in our lives. Phenomenal! Bree's story was when my eyes really locked into the words on the page and reeled me in further, but the ending was just breathtaking. Too many to choose from! Everyone. YA Contemporary lovers, even Adult readers are going to be moved by Let's Get Lost. 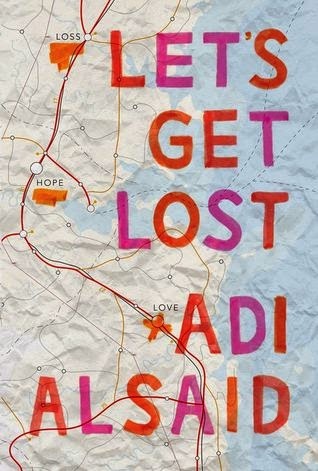 It's reminiscent of a John Green book, so if you love his work, you'll love Adi's writing, too. Have you read Let's Get Lost? Tell me what you think in the comments or on twitter!